Jollibee launched its new Jolly Crispy Flavored Fries last month. There are two exciting ways to enjoy your favorite Jolly Crispy Fries: through generous sprinklings of cheesy Super Cheese and delicious Sour Cream! And these Jolly Crispy Flavored Fries are fast becoming the favorite snack to share! 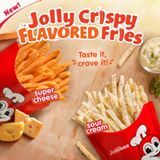 Now the fun part is that Jollibee invites you to try the Jolly Crispy Flavored Fries in its sampling event this May 4, 2016 (happening simultaneously between at 2pm-3pm) in 140 participating Jollibee stores nationwide. Make a stand if you would go for a #TeamSuperCheese or #TeamSourCream flavor. 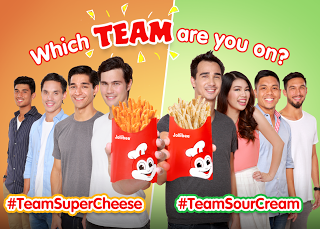 Do post a photo with the tags: @bestfriendjollibee #TeamSuperCheese or #TeamSourCream on INSTAGRAM. You may also post it on Facebook and Twitter. Visit the Jollibee Facebook page at http://facebook.com/jollibeephilippines or Jollibee on Twitter @jollibee to find out know more about Jollibee's nationwide sampling tomorrow.